From my patch along the Jordan River in Salt Lake: The river bends in this area and has created the steep bank shown here. As I approached this area I could hear a Belted Kingfisher's rattle, so I worked to be more stealthy in order to get a photo of this awesome bird which has continued to eluded me. Suddenly a Kingfisher bolted out of a hole in the dirt bank and second Kingfisher joined it in a raucous flight. I had discovered a Belted Kingfisher nesting burrow in my patch! I never got that Kingfisher picture, but I am excited to observe whatever I can at this nest site. It is right next to a walking/biking trail, so I am hopeful that they are accustomed to regular passers-by. Black-billed Magpies are prolific nest engineers. They build a secure bed of twigs and even create a domed roof for protection from weather and predators. It is always worthwhile to check out every Magpie nest you see. I have seen both Great Horned Owls and Long-eared Owls using old Magpie nests, often removing most of the dome roof. 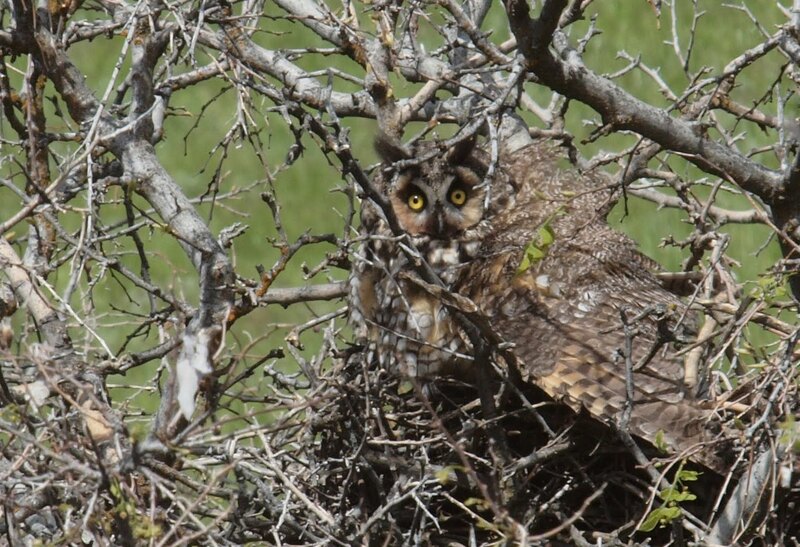 Below is a Long-eared Owl I discovered nesting on a Magpie nest in my old neighborhood in the Boise foothills. I have also seen Raccoons in winter huddled up in these Magpie-built hotels. Wow cool for the long-eared owl... It has only been seen a very few numbers of time over here! Well done Phil! Great find of the kingfisher nest! We have them near us, but they always disappear once I get near. Haven't found the nest yet. @Chris - I love long-eared owls. Now to find them in Utah...! @Mike B. - found one other B-Kingfisher nest in Idaho, but this on is in "my patch" so I'm extra excited about that! @Kathy D. - thanks Kathy - she wasn't happy as I was too close. I snapped the shot and quickly backed away. Great story and photos Robert. I did not know that magpies built roofs over their heads! I love learning new things! Thanks! Fox Sparrow at my patch!